HÀ NỘI — The Hà Nội People’s Committee wants special powers to help restore old buildings. They have asked the Ministry of Construction to put their proposals to the Government in the hope of easing difficulties with building projects. 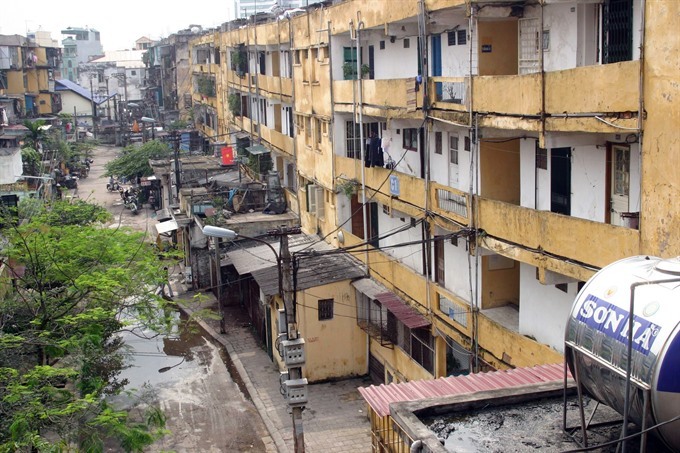 Under the current regulations on construction and planning management, the restoration of old and degraded apartment buildings in the inner city’s four districts of Ba Đình, Hoàn Kiếm, Đống Đa and Hai Bà Trưng has faced obstacles such as height limits, limiting their ability to attract investment. The authority wants the Central Government to award it mechanisms in accordance with the reality of the capital so as to remove obstacles to renovation and construction activities. This would help ensure the feasibility of projects and interests between the State, the people and investors. The committee asked to be given permission to grant licenses for projects initiated by the municipal authority. The committee wanted to be allowed to shift some projects from commercial housing to social housing to meet reallocation demands. Adjusting construction areas of commercial and social housing projects which have up to 500 apartments and evaluating projects up to 2,500 apartments would help cut administrative procedures. The municipal committee said that adjusting the rate of investment for constructing schools and medical infrastructure was necessary because of differences in construction density between rural and urban areas. According to Lê Văn Dục, director of the Hà Nội Construction Department, the capital city has focused on construction management and urban development since early this year. The city has approved plans for major roads and restoration projects of 28 old apartment buildings, and given instructions for relevant offices to study specific planning projects such as the construction of underground parking spaces in four districts, Dục said. The city has continued to invest in transportation infrastructure and social housing projects. Investment into urban development – such as planting new trees and building more parks and flower gardens – was also a focus. As of last month, the city planted more than 387,100 trees, bringing the total number of trees planted to 927,800 trees, reaching 92.7 per cent of the goal of planting one million trees. “However, the management of construction and urban development in Hà Nội has exposed some shortcomings including the slow progress of some key projects such the urban railway projects and belt road construction which,” the director said. There have been several violations on construction and urban planning which have not bee dealt with yet.